Members of the lily family, tulips are native to central and western Asia. 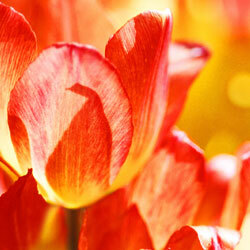 In the 16th century, they were introduced to the Netherlands where most tulip bulbs are grown today. With over 100 species and nearly 3,000 varieties, tulips have been divided into 14 groups, including Darwin hybrids, Triumph, Lily-flowering, Double early, Rembrandt, Scheepers’ Hybrids (or French) and Parrot variations. Their classification is based on form and habit. 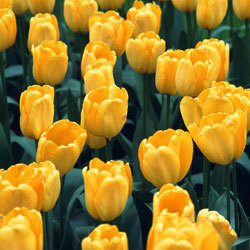 A 15th group includes species tulips with the smallest plants growing to just 3 inches. Tulips are an easy care addition to any landscape, and they are easier to plant than many gardeners realize. Choose only top-sized bulbs without any bruises or obvious damage. Bigger bulbs generally indicate better quality and bigger flowers. Plant bulbs as soon as purchased or store in a cool, dry location. Choose a sunny (or part sun) location with well-drained, rich soil. Plant 2” deeper than recommended to promote re-blooming each year. Apply bone meal 3 times a year – in fall when you plant, in spring as bulbs emerge from the ground and after flowering has finished. This will provide food for the foliage and bulb growth for next year’s flowers. Protect tulip bulbs from pest damage by laying wire mesh on top of your bed just beneath the soil. Sprinkling VoleBlok in the holes when planting can also be helpful. Mulch and water the bed thoroughly after planting. Plant before the ground freezes. Deadhead flowers after they have faded, but leave the foliage to die back naturally. Do not cut off the leaves until they have turned brown, or else they will not develop large enough bulbs for a good show the next year. Don’t have much time to plant a large, luxurious tulip bed? Plant 100 tulips in just 1 hour! Choose a part to full sun location and dig a hole 6’ x 6’ to a depth of 6-8”, placing the displaced soil on plywood or cardboard. Place 100 tulips, pointed end up, evenly over the area. Gently slide the soil from the plywood or cardboard onto the tulip bulbs. Tamp the soil lightly, sprinkle the bed with bone meal and water well. In spring, the entire area will bloom! Some tulips can be finicky, and while some tulips will disappear from your garden after a year or two, these selections promise trouble-free blooms for years! 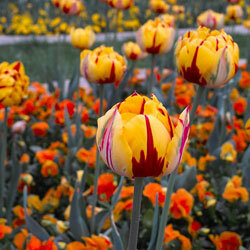 ‘Daydream’ – Darwin tulip, changing colors while in bloom to vibrant apricot-orange, blooms mid-April into May, Ht: 22”. Fragrant. ‘Lilac Wonder’ – Species tulip, large rose-lilac flowers with yellow bases and anthers, blooms May, Ht: 7”. Prefers full sun. T. praestans ‘Fusilier’ – Multi-flowering species tulip, orange-scarlet flowers, blooms April, Ht: 8-12”. T. clusiana var. chrysantha – Species tulip, good naturalizing tetraploid, deep yellow flushed with rose toward the edges, blooms April, Ht: 8”. ‘Pink Impression’ – Darwin tulip, huge flower with strong, clear pink flowers, blooms mid-April to May, Ht: 22”. ‘Menton’ – Scheepers’ hybrid, blooms are shades of apricot, rose, pink and peach, late-blooming, Ht: 26”. ‘Mrs. John T. Scheepers’ – Huge Scheepers’ hybrid, golden-yellow tetraploid is a three-time award winner, late-blooming, Ht: 26”. ‘Persian Pearl’ – Species tulip, deep magenta-rose with buttercup yellow star on the inside, blooms April, Ht: 6”. ‘Maureen’ – Scheepers’ offspring, large, oval-shaped flowers of glistening white, blooms late-May, Ht: 28”. Four-time award winner! ‘La Courtine’ – A Scheepers hybrid, yellow flowers are oval-shaped, flamed with red from the bottom up, late-blooming, Ht: 26”. With so many to choose from, it’s always time for tulips!